http://support.microsoft.com/kb/320397 (Windows may not start and you may receive an "NTLDR is missing" error message if Windows is not up-to-date and there are too many files in the root folder) in which you'll find out why Microsoft had to change the Boot Record code for Windows 2000 with Service Pack 4 (SP4) and Windows XP with Service Pack 2 (SP2). Note: Installing Windows XP SP2 or Windows 2000 SP4, will not correct this issue on existing volumes. To update the boot code on existing volumes, you must either obtain and run the utility "bcupdate2.exe" (MD5 hash value is: "2e2ed06d9ae54c8d959a534a83284705") from Microsoft, or manually change the boot code using an updated copy. The service pack updates will only write the new boot code for new volumes; they cannot correct old volumes. You can contact us here if you have a specific question about this page. A View of the NTFS Boot Record in a Disk Editor (On a separate page). This page examines the NTFS Boot Record for Windows 2000 (NT5) and Windows XP (NT5.1). Although Windows 2000 and XP can both use the MS-FAT32 File System, we'd advise anyone interested in serious computing to run these operating systems in NTFS formatted partitions (rather than FAT32*) for a number of reasons; which include better performance, less wasted space and greater security. One or more FAT32 partitions can also reside on the same disk if required. For example, if a disk drive includes an OS that cannot write to an NTFS partition, then it might be able to write to a FAT32 partition which could act as a communications buffer for sharing data among Windows™ and some other operating system. *There's one odd quirk about maintaining FAT partitions under either Windows 2000 or XP you should know about: If you delete a file directly (without sending it to the Recycle Bin; using SHIFT+DEL keys for example), it can be very difficult, if even possible, to recover that file! For some odd reason, these OSs zero-out the 'high bits' (upper 16 bits) of any FAT file's starting cluster number! This affects any file deleted directly which is located beyond a starting cluster of 65,535. [When NTFS was first unveiled, Linux users couldn't access data in NTFS partitions. There was, however, a great deal of development launched within the Linux community (and commercial interests) that would eventually allow Linux users to have both read (first) and write (later on) access to NTFS partitions. Programmers had already initiated projects that would allow Windows™ users access to data stored in Extended file systems. An example of the latter is the free Windows™ utility explore2fs by John Newbigin, for acquiring files directly from ext2 or ext3 partitions: http://www.chrysocome.net/explore2fs. But if you try to copy files from Linux to Windows, you'll most likely end up with them all having the current date/time! Then there were a number of Linux distributions which allowed users to read files directly from NTFS partitions, but creating reliable writes (those which do not cause any issues when subsequently accessing edited or newly created files from a Windows™ OS) was more difficult to accomplish. Kernel drivers from the linux-ntfs project were in the forefront years ago in attempting to provide a reliable solution. (Their website was damaged around August 2007 and never regained its former position as a reference site for open-source developers; instead the domain name now jumps directly to their commercial site, 'Tuxera'. Note: If you find a copy of the site's announcement of a "recently released" ntfsprogs 2.0.0 (with full read/write support), that was made in 2007. You can check some of its earlier contents using these: WayBackMachine archive pages.) You may wish to review their research on NTFS here: ntfsdoc.pdf. But exercise caution when making use of the information. For example, in Chapter 1, section 4.2.1, it states: "Hidden at the end of the volume, is a copy of the boot sector (cluster 0)." If you take this to mean the copied sector resides within the volume, that would be incorrect. As we'll point out below, the NTFS "Backup Boot Sector" isn't really part of the NTFS Volume; it's actually stored in a sector immediately following the last sector of the Volume, which makes an NTFS Volume's partition size 1 sector larger than its Volume size! Did ntfsprogs 2.0.0 provide the support for writing to NTFS partitions we were hoping for? For the most part, yes! Under FC10 (Fedora Core 10), we created and were able to write to an NTFS disk with good results; unlike previous experiences we'd had using earlier tools under various Linux distros. We used GParted 0.4.3 (with Libparted 1.8.8) to create and format a new NTFS partition; it used the command mkntfs -Q -v (that's mkntfs 2.0.0 with libntfs 10:0:0 from the linux-ntfs project's ntfsprogs) to do so. Currently we are testing an Ubuntu 10.04 LTS install . . . . Although Microsoft's NTFS Boot Record has been described as being only a single sector (we did so here at TheStarman's Realm for many years! ), the truth is that it would never be able to boot up a Win 2000/XP OS without the next six sectors (and more for Win 7 and later) that comprise most of an NTFS partition's Boot Code. So an NTFS partition's Boot Record should be considered as all 16 sectors of what the MFT (Master File Table) itself calls the $Boot file. And in fact, before most users switched to the NT file system, they already knew of a VBR (Volume 'Boot Record') that was comprised of more than a single sector in the FAT32 file system. Thus, the Bootstrap Code which follows the 'Boot Sector' is a necessity for booting an OS from an NT file system. Microsoft states here that the OS itself: allocates the first 16 sectors for the boot sector and the bootstrap code1. So we can't help but wonder if there are any programmers who've worked on a way to enhance this bootstrap code by adding more features to it. The NTFS Boot "Record" is 16 sectors long! The term "Boot Record" is not a good description when used of the first sector of a floppy diskette or USB drive or any other type of external (to a PC) storage media when it's only used to access data files on that media. It is, however, an historical reference to the fact that PC's in the past were quite often, if not solely, boot into an OS from a floppy diskette. But those early "Boot Records" also required the necessary boot files (e.g., "ibmbio.com" and "ibmdos.com"; and the code in them) to be present in order to load their file systems (which would have been DOS back then) into Memory before reading or writing files from or to the diskette (or later on, a hard drive). It should be noted that the only data that was actually required to be present in those early Boot Records for a 'data' diskette (or other type of FAT storage media) was the BIOS Parameter Block (see BPB below). And today is no different: You can zero-out all but the first sector of an NTFS $Boot record's 16 sectors, and even remove all of the remaining Bootstrap Code from its Boot Sector without ever keeping an OS from accessing that volume's files! All of that code is only used if an OS must be boot-up from within that volume. And if one examines a number of floppy disks from the past, eventually a "Boot Record" containing only a BPB and a very short string of code that displays something similar to: 'This is not a bootable diskette.' would be found. Why? So floppy diskette manufacturers could never be accused of copying any IBM or Microsoft code. Our examination will mostly be limited to just the code in the first sector. Once we began examining the code, we found that the boot sector actually loads all 15 of the remaining bootstrap or NTLDR Loader sectors into Memory; even though the last eight sectors are nothing but zero-bytes! Take this link to see: The NTFS Boot Record as viewed in a Disk Editor. [ Opens in a new window, so you can refer to it later! ] Includes color-highlighting of the code, BPB, Error Messages, etc. The NTFS Boot Record is loaded into the usual Memory location of 0000:7C00 by the MBR code (see the Windows 2000/XP MBR page for more info). Locations 7C0Bh through 7C53h are filled with the NTFS BPB (Bios Parameter Block), and the next 303 bytes (7C54h through 7D82h) contain this sector's executable code (the main program and various subroutines) which eventually load the N.T.L.D.R. (or Bootstrap) or Loader sectors into Memory (do not confuse these sectors with the ntldr program file itself which is found in the root directory of Win NT/2000/XP/2003 OS partitions). [Note: Be aware that many of the Hex numbers in Microsoft's tables and even the text on this page (and others) do not use what we'd call normal Hex representation! They use the symbol "0x" in a nonstandard manner, saying for example, that: "0x3F000000" is "little-endian" for decimal 63. Although they do describe this usage (you have to look hard for it), it's still incorrect according to all programming languages (such as C or C++) that use "0x"; including Microsoft's own compilers! Preceding any value with "0x" should always mean a normal Hexadecimal number. For example, if you search for "0x" on this page, the first instance is: "0x55AA" in the main section "Disk Sectors Critical to Startup" in the first paragraph under "Master Boot Record" where this value is called a "signature word or end of sector marker." Yet the very next paragraph, states a disk signature may occur at offset "0x01B8"; which is inconsistent with the first instance of "0x"! If that offset was stored anywhere on a hard disk, it appears Microsoft would have written "0xB801" instead. In "Table 32.2 Partition Table Fields" in the row labeled "0x01C6" under the "Byte Offset" column, you'll find: "0x3F000000" under the "Sample Value" column along with the explanation: "The offset from the beginning of the disk to the beginning of the volume, counting by sectors." It isn't until you finally read the notes under this table, that its author(s) state: "Numbers larger than one byte are stored in little endian format, or reverse-byte ordering. .... For example, the sample value for the Relative Sectors field in the previous table, 0x3F000000, is a little endian representation of 0x0000003F." After reading that, your very next thought should be: How are we supposed to know when it does or doesn't mean that? The symbol "0x" by itself does not indicate that. Furthermore, a portion of the note which wasn't quoted above, read: "Little endian format is a method of storing a number so that the least significant byte appears first..." and with that we certainly agree, but then their statement adds: "...in the hexadecimal number notation." In the "number notation"? This last phrase is just plain wrong! It had already been agreed that when you pre-pend "0x" (or append an "h") these symbols indicate hexadecimal rather than decimal-based numbers. Apparently, some Microsoft author(s) decided to make things a bit easier for themselves by using it differently, rather than considering how this might confuse their readers. The term "Little-endian" should only apply to the actual byte-order on a storage medium or in Memory. Rather than confuse people, these authors should drop the "0x" hex indicator, and simply write a string of bytes with or without spaces between them, then let us know that's how the bytes would appear in a disk editor. Although this insanely inconsistent usage seems to have begun only in this publishing portion of Microsoft's world, we have now found other authors copying it; usually when discussing a Boot Record's signature Word 0xAA55 (this is the only correct way to state that using "0x"). It appears the Microsoft authors writing these pages used the symbol "0x" in whatever way suited them at the moment; such as how a particular type of CPU represents a Hex number for a given length of bytes in one sentence, but then in the very next sentence, an offset for locating some byte(s) on a disk is written as a normal Hex number. Imagine the confusion if a stock analyst wrote in a tiny footnote: 'In this report, $100.00 of shares are really worth only $000.01 (1 penny); unless I decide otherwise!' then listed his inflated data that way? Microsoft texts should not be written like Alice in Wonderland. We're supposed to be dealing with helpful facts, and Microsoft's statement about some special little-endian use of 0x only makes the material more confusing for students trying to understand it! "0x" should only pre-pend pure Hex numbers (as understood by humans); independent of their storage medium's endianness! After all, we are human beings; there's no intel chip inside my brain! But even if there were, it still wouldn't know for sure when "0x" meant a "little-endian number" and when it didn't without an indicator of some kind. We don't believe this is an unreasonable expectation. We do see how this odd usage might make things easier for Microsoft® authors to document their file systems, but it shouldn't be at the expense of producing confusion by changing the meaning of an established standard. So, to avoid any further confusion, all our Hex Bytes, Words, Double Words, etc. in the tables below are shown as plain Hex values (without any pre-pended symbols) in the columns marked "Hex Numbers"; they will be the same Hex numbers no matter which processor you use or how the number is stored in Memory or on a hard disk, unless we need to make their byte-order clear. Although it actually makes sense in this case (after examining the code for the NTFS Boot Record), to call the first sector the boot sector and the rest of it the bootstrap code, this isn't true of all operating systems. For example, the first sector of the MSWIN4.1 Boot Record's three sectors, cannot be thought of as having a separate function from the code in its third sector (so the phrase boot sector does not apply to the MSWIN4.1 Boot Record). The Win 2000/XP OSs make a "backup" of each NTFS volume's Boot Record which they store in the very last sector of its partition! Brian Carrier, the developer of The Sleuth Kit ( TSK) appeared to have discovered this for himself when writing about the 'backup copy' of the boot sector on page 220 of his work, File System Forensic Analysis (2005; Addison Wesley). But instead of stating as we did here, that the Volume is 1 sector less than the size of its Partition, it seems to us he mistakenly chalked this up to something he called 'the NTFS file system size' being smaller than the NTFS Volume: "My survey of Windows NT 4.0, 2000, and XP volumes had the backup copy in the last sector. I found that the total number of sectors in the file system was less than the total number of sectors in the volume, so the backup copy of the boot sector did not have to be allocated to a specific file." As usual, you must be careful when researching for technical facts; we cannot guarantee everything will always be correct at The Starman's Realm either. The following table describes what the values in the "Hex Dump" above mean. Offsets for each field are taken from the beginning (00h) of the Boot Record (which is located at Absolute Sector 63 for the first partition on most hard disks). Microsoft® came up with an entirely new Extended BPB for its NTFS File System. Although it does contain some fields that are used for the same items as previous versions, beginning with offset 28h those are completely cast aside in favor of the much larger (LONG LONG Word) fields that are needed by NTFS! Reference " If maximum compatibility is desired, only the value 512 should be used. There is a lot of FAT code in the world that is basically "hard wired" to 512 bytes per sector and doesn't bother to check this field to make sure it is 512. [So]...values [other than 512] are not recommended." " Number of sectors per allocation unit. This value must be a power of 2 that is greater than 0. Values of 1, 2, 4, 8 are quite common." We've never seen anything but zero here for NTFS (has anyone's BPB On Disk ever had anything else here?). NOTE: Under Windows 7 / 8, After loading into Memory, 7C0Eh is set to the DRIVE NUMBER (usually 80h) by the MBR here, then used by both the VBR (here and following) and the BOOTMGR Loader code (when reusing the VBR code as well as: here) when reading sectors from the Boot Drive. Bytes per Sector divided by 16; which is then used in an interesting way to read the remaining 15 sectors of the VBR Area into Memory at lines 7CBB through 7CD4 and the Subroutine at 7C0:011D. The stored value of Bytes per Sector divided by 16 (which is often 20h, since 512 / 16 = 32) is also used in a similar way by the Win 7 BOOTMGR Loader code at 7D59. 10h Byte 00 N/A Must always be zero for NTFS volumes (originally the number of FATs for a FAT partition). 11h 2 Bytes 0000 N/A Must always be zero for NTFS volumes (originally the Max. Root Directory Entries under FAT12/16). 13h 2 Bytes 0000 N/A Most often set to zero, but not used by NTFS (orig. used for the FAT12/16 small sectors count; must be zero for FAT32). 15h Byte F8 "Fixed Disk" Media Descriptor ID. ( Win 2000/XP do not use it, but other code might so it's set to F8). 16h 2 Bytes 0000 N/A Must be set to zero for NTFS volumes (originally for FAT12/16 "Sectors per FAT" value). Note: Under Windows™ Vista and Windows™ 7, the number of "Hidden" or Reserved Sectors for the first partition has been increased to 2048 (0x800) rather than 63 (0x3F).
" 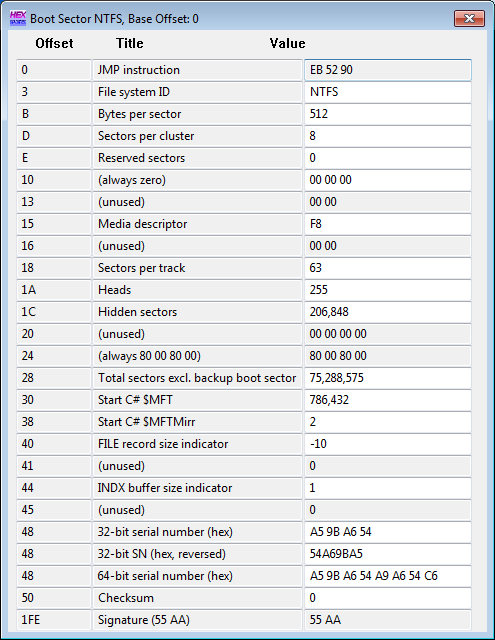 Count of hidden sectors preceding the partition that contains this [NTFS] volume. This field is generally only relevant for media visible on interrupt 0x13. This field should always be zero on media that are not partitioned. Exactly what value is appropriate is operating system specific." [ Although I'm not exactly sure what all the implications are of this quote from Microsoft, I can tell you that this value is definitely used while reading the boot sectors into Memory! See line: 7CCF in the Subroutine below. This value is supposed to be the number of physical sectors on the disk preceding the first sector of this volume; it's obvious why the first entry in a disk's partition table has a 63 here, but it will also be a 63 for each Logical volume on a disk since each Logical volume in an Extended Partition is preceded by its own Extended MBR. So, this value varies only for an NTFS partition that is a 2nd, 3rd or 4th Primary Partition. Is it safe to change this value for booting a Windows OS? & Can Win 2000/XP boot from an Extended partition? 20h 4 Bytes 00000000 N/A Most often set to zero, but not used by NTFS (originally used for the Total Number of Sectors in a FAT32 volume). is the drive number ! According to most documentation, this area is not supposed to be used by NTFS, but after examining the code in the Boot Record, it seems clear that the first byte of these four bytes is used to set the drive number! (See offsets: 7C7B and 7CAF). Boot Sector" is not considered part of the NTFS Volume. 0x0C0000 (786,432). See our Introduction to NTFS, Layouts, Era 2. 0000EF8D 61,325* Starting Cluster Number for the $MFTMirr File in the center of this partition. after the Volume Boot Record. At LCN 0x02 (Logical Sector 16 for 4 KiB clusters). See our Introduction to NTFS, Layouts, Era 3, for more on this change. The Number of Clusters for each MFT record, which can be a negative number when the cluster size (8 sectors in this case) is larger than the MFT File Record size! The value F6 hex (which appears as 246 decimal in many utility programs) is in fact a negative 10 (-10 decimal). However, you obviously can not have a negative number of clusters! So, a negative number here is instead an indicator that the record length for any MFT File Record is: 2 to the power of the absolute value of this negative number; which of course, results in a positive number. For our example values above, that would be: 2 ^ (|-10|) = 2 ^ 10 = 1024 bytes! This number agrees perfectly with the MFT Record sizes we've seen on real disks. Microsoft® finally documented this in their Windows XP Professional Resource Kit, Table 28-17, stating: "If this number is positive (up to 0x7F), it represents Clusters per MFT record. If the number is negative (0x80 to 0xFF), the size of the File Record is 2 raised to the absolute value of this number." Prior to this, we had already reached the similar outcome as expressed in note (c) on page 49 of the Linux-NTFS Project's ntfsdoc.pdf file. 41h 3 Bytes 000000 N/A Most often set to zero, but unused by NTFS. Thus, the size of each Index Buffer; used to allocate space for NTFS structures such as Directories. 45h 3 Bytes 000000 N/A Most often set to zero, but unused by NTFS. Obviously, we must look into this further to find out how all these bytes are being used by the Operating System! We've never seen anything except all zero bytes in this field, but some call this field a 'Checksum'. The Microsoft Windows XP Professional Resource Kit, Troubleshooting Disks and File Systems, section "Disk Sectors Critical to Startup" heading "NTFS Boot Sector" Table 28-17 "BPB and Extended BPB Fields on NTFS Volumes" and the Boot Record display field names from Power Quest's Partition Info program for Windows NT/2000/XP (PartInNT.exe; 09/16/2002 2:04AM 859,136 bytes MD5 sum: 1f74ca66c42ff49f114b8c471d3ef88a). See below for an example screenshot. As stated above, it's been our experience that both the Windows 2000 and Windows XP Boot Record (a single sector) plus the Bootstrap Code consists of seven sectors beginning with the one we're examining in detail on this page. But the code itself shows that all 16 sectors of the NTFS Boot Record "Area" are loaded into Memory. In NTFS file system terminology, the first 16 sectors of an NTFS partition are known as the $Boot (which occupies Clusters 0 through 1 on most systems; those with 8-sector/4 KB clusters). N   .   T   .   L   .   D   .   R   .             $  . which is mostly Unicode for the 5 characters: NTLDR; the preceding "05 00" means the following Unicode string is 5 characters long. These are followed by "04 00" and Unicode for a $ sign. The next line begins with: "49 00 33 00 30 00" (we have observed these same 10 hex bytes; which taken together are seen in ASCII as: "..$.I.3.0. ", in some NTFS Metadata File Records). The Third through Sixth sectors don't really have any outstanding features, and the Seventh sector ends with 138 zero bytes (300 in the original code prior to Windows XP SP2). On a newly formatted NTFS volume, the $Boot is immediately followed by the index to the $MFT (Master File Table) which usually contains a number of sectors full of FF bytes (often part of $Bitmap) before you can find something which is humanly intelligible! Most NTFS volumes will also contain some Metadata (system files) in the middle of the partition; such as, $MFTMirr (a backup copy of the first four $MFT records) and $LogFile (which is the NTFS journal and can be many megabytes in size). NOTE: On volumes that have had many files added and deleted, and especially those which have come close to running out of space, the Master File Table may have been relocated. ;   Block) to code at 0x7C54. ; 7C03 thru 7C0A  'NTFS    '     8-byte OEM ID or System Name. ;                  explanation of each parameter field in the BPB. 7C40  F6 00 00 00 02 00 00 00 DB 05 66 38 2B 66 38 1A   ..........f8+f8. 7C54 FA            CLI                  ; Disable maskable Interrupts. 7C57 8ED0          MOV     SS,AX        ;   and Stack Segment Registers. 7C5C FB            STI                  ; Enable Interrupts again. ;       (such as ) are still to the same bytes in the BPB above! 7C5D B8C007        MOV     AX,07C0      ;|-> This is important to know! ;   to determine Total Sectors! ; The following code copies the Boot Sector (VBR) and all 15 sectors of the VBR "Bootstrap" Area which follows it into Linear Memory locations 0xD000 through 0xEFFF; including 9 full zero-filled sectors plus the padding at the end of the 7th sector, for a total of 4,746 zero bytes in Memory locations 0xDD76 through 0xEFFF; thus, the code and data bytes end at Memory location 0xDD75. 7C68 8EC0          MOV     ES,AX        ;|Set Extra Segment to D00 hex. 7C6A 33DB          XOR     BX,BX        ; Zero-out the Base Register. ; Exit Point of the Boot Sector code. Execution resumes in the NTLDR Bootstrap code section now located in Memory; beginning at Linear address 0xD26A. ; stored by subroutine above. ; with the NTLDR Loader Section! ; See BPB chart for Offset 24h. 7C81 CD13          INT     13           ; "Get Drive Parameters"
;             AH = 00h and CF is cleared (set to 0) if successful. ;  CL (bits 5-0) = Maximum Sector Number. ;             DH = Maximum   Head Number. ;             DL = Number of drives on the system. ;    FE h + 1 = FF h; or 255 Heads). ;    have 3F h = 63 Sectors per Head). ; (so often 16,065 for Desktop drives). ; so that CX now equals Max Cyl number! ;  3FF h + 1 = 400 h; or 1024 Cylinders). ; 1024 or less cylinders! ; Disk in [0000:7C20] (4-byte Word). ; NOTE: A 4-byte Word for Total Sectors allows for almost 2048 Binary GB! ; really possible using only CHS notation and standard BIOS functions. ; 16,450,560 sectors = 8,422,686,720 bytes (or only about 7.8 Binary GB)]. ; 0xFB0400) sectors; actual CAPACITY must be determined by other means. ;  BIOS Extensions" in Memory. 7CAF 8A162400      MOV     DL,    ; -> 80h (for First drive). ;         ESP, EBP, ESI, and EDI. 7CCF 6603061C00  * add     eax,[001C] ;  Number of "Hidden Sectors"
7CD4 663B062000  * cmp     eax, ; Apparent Total Sectors on Disk. ;    1024 Cylinders of Disk Drive! 7CF4 E8B3FF        CALL    7CAA         ; Check for Extended INT 13 code. 7CFC 0F846100    * jz      7D61         ; Extensions are not installed. ; -> "A disk read error..." etc. ;    " Extended Read "
7D02 8A162400      MOV     DL,    ; -> "80h" (first hard drive). 7D42 CD13          INT     13            ; "Read Sector into Memory"
7D44 0F821900    * jb      7D61          ; -> "A disk read error..." etc. ; (512 bytes) to Linear address. 7D4F 66FF061000  * inc     dword     ; Increment offset to Sector location. ; many Sectors are left to read. ; -> "A disk read error occurred"
7D67 A0FB01        MOV     AL,[01FB]   ; Contains C9h (for English string). ; -> "Press Ctrl+Alt+Del to restart"
;       so a reboot is necessary! 7D72 8BF0          MOV     SI,AX       ; Offsets in AL -> Error Messages. ;    at a time and INC SI pointer. ;    the Error Message strings. 7D80 EBF2          JMP 7D74            ; Do it all over again . . .
7D90  20 65 72 72 6F 72 20 6F 63 63 75 72 72 65 64 00    error occurred. 7DF0  00 00 00 00 00 00 00 00 83 A0 B3 C9 00 00 55 AA   ..............U. Entries 1, 2 and 23 are in the first sector of the Boot Record, but are not part of the BPB or Extended BPB. All of the red colored boxes show entries which must be zero in order for this to be an NTFS Boot Record. Note the eight-byte Serial Number in the pink box. Although documentation from Microsoft indicates that the data in the 'white' boxes (5, 8, 14 and 15) is unused by NTFS systems, we've seen only zero bytes in boxes 5, 8 and 14, and the '80 00 80 00' entry in box 15. Please refer to our detailed notes above on the BPB entries; especially for boxes 15 and 19. First Published: June 6, 2007 (2007.06.06). Updated: 29 JAN 2009 (29.01.2009); 1 FEB 2009 (01.02.2009); 1 MAR 2009 (01.03.2009); 8 MAR 2009 (08.03.2009); 16 AUG 2009 (16.08.2009); 6 MAR 2010 (06.03.2010); 26 AUG 2012 (26.08.2012); 2 SEP 2012 (02.09.2012); 20 FEB 2015 (20.02.2015); 7 JUL 2015 (07.07.2015); 10 JUL 2015 (10.07.2015); 12 JUL 2015 (12.07.2015); 19 JUL 2015 (19.07.2015) - Corrected some misktakes; 30 AUG 2015 (30.08.2015); 10 SEP 2015 (10.09.2015); 16 SEP 2015 (16.09.2015) - more notes related to use of BPB copies in Memory by the Windows 7 VBR and BOOTMGR Loader code; 5 MAR 2018 (05.03.2018). Last Update: April 5, 2018 (05.04.2018). You can write to us using this: contact page (opens in a new window).